Please tell us a little about who you are and what you did before getting into real estate investing. 18. What Financial Services Do You Need? dam Hardy owns and manages over 40 single family rental properties and is the owner of Hardy Capital & Consulting, a real estate and tax consulting business in Brooklyn Park, Minnesota. He is a member of the Minnesota Real Estate Investors Association (MnREIA) in suburban Minneapolis, and has been investing since 2006.
ince the inaugural issue of the Real Estate Journal, we have talked about the “new” economy and the way things have changed since 2008. It seems the first rule of the new economy is everything changes, so it should come as no surprise that in the course of the past few years, the “new economy” itself changed. We cannot seem to settle into a new normal. As things continue to transform, grow, modify and move on it is creating different responses from individuals. Many are just happy to ride the growth train and aren’t bothering to look past tomorrow. Full steam ahead, caution be damned! Others that have been down this road before are starting to get anxious. Can we really continue at this pace for more than a few short years? And if we can’t, what is on the other side of this boom? Another bust? How big will that be? How will it affect real estate investors? I have given a “State of the Industry” update at our annual education conference each year since 2009. Things were quite grim for a while in terms of financing and health of the economy but inventory – due to foreclosures, short sales and the like was great, pricing was good, and rentals became the business to be in. Now foreclosures and short sales have dried up, price appreciation has made some neighborhoods almost out of reach for any ROI, but financing has relaxed a bit and the economy – and therefore demand – has been strong. In the beginning, these updates were very popular – uncertainty abounded. to help ease the affordability problem and other housing-related challenges communities are facing. This is why our legislative program is so important. Our voice as investors must be heard. In March we hosted our annual Capitol Conference where we took our concerns and solutions to Washington, D.C. There we ensured that we aren’t seen as the problem but as the provider of the solutions to our nation’s housing woes. After all, without housing, the U.S. economy would still be struggling to regain strength. We will continue to bring you information about the economy, the industry, and those who are excelling within it. Our goal remains the same: to create communities where people matter, where ideas count, where creativity sparks new opportunities, where each of us can make a difference. As real estate investors, we are uniquely positioned to do all that and still make a great profit! Investors can be “doing well while doing good,” as Benjamin Franklin so wisely advised. With the information we provide, we hope you will look at this new phase of the new economy with fresh insights, fresh energy, and a fresh commitment to reinventing the world of real estate investing and improving the communities where you invest as proud professional housing providers. Rebecca McLean is the Executive Director of the National Real Estate Investors Association. f you were ever are a fan of “Where’s Waldo?” you may just enjoy looking for the theme and legislation that Congress is working on developing. No I’m not referring to the the fringe bills introduced by one or two congressman. What’s not just hidden, and may be completely missing is the more broadly supported – dare I say it? Bipartisan bills. Having recently spent a week in Washington DC visiting with members of Congress in both houses, on both sides of the aisle, it is pretty clear that the divide is becoming more pronounced and more partisan. Even the Problem Solver Caucus, which is an assembly of centrists from both parties, is having great difficulty building coalition support outside their numbers. With less than 50 members and a 2-to-1 ratio of Ds to Rs, the likelihood of success is dwindling. Even within the House majority party, the Democrats seem to be fighting a civil war over priorities ranging from progressive to outright socialism. This instability when combined with the star-power of some of the newest and most outspoken of the freshmen congressional leaders is creating an impact that will be felt for years to come. the complicated and final version of the Affordable Care Act, (ACA or Obamacare) was well over 800 pages with 20K pages of regulations to follow. That being said, there is not a consistent definition of “infrastructure.” This means municipalities will continue to shoulder more of the burden of road repairs and, to the extent they can, shift more cost to developers and redevelopers, pushing up capital costs for redevelopment in local communities. Flood Insurance Tink tink tink…that’s the sound of the can being kicked down the road. Even the re-authorization of the current flood insurance program has been pushed down the road. The fact that the program needs a major overhaul, not just for actuarial purposes but even in its management is recognized by almost everyone, but having the time to fi x it or the willingness to develop a passable solution is unlikely. Seller Finance The Seller Finance effort is working on a joint House and Senate bill to be dropped very soon after which time members will be encouraged to ask their Senators and Representative to sign on, if they haven’t already. The ground work laid over the past couple years is leading to this new two-pronged approach. Did you know? R e a l E s t a t e I n v e s t i n g To d a y i s the online news site for National REIA featuring daily updates with news and information that affects yo u r b ot to m - lin e . I t ’s u p d ate d d a i l y, n eve r b o r i n g a n d a l w ay s informative. that the anti-capitalist movement is not only gaining traction but flies directly in the face of the present realities. Consider which government housing option would be preferred to the market rate options? And if that market rate housing were suddenly governmentrun, would it fare better than the current 1.2 Million public housing units managed by more than 3,300 housing authorities with an estimated $26-30 Billion in deferred maintenance? Housing affordability is a serious matter – often cured with a job, or a better job. For the disabled and seniors, a safety net is definitely needed. However, the US has taken a different approach to the mentally and physically capable – starting with Welfare Reform in the 1990’s. There are significant voices pushing for similar changes in housing as well. In the meantime, the House-them-at-all-cost advocates will continue to engage Rent Control efforts in states like Illinois and Oregon, ignoring the basics of Economics 101. A sub-category of Affordable Housing is premised as child-stability. Evictions are disruptive and can cause children to be moved abruptly between schools. The results of these moves can slow the educational process for the child. While this has an element of public concern, the same care is not considered for the family in foreclosure. Instead eviction prevention laws are being pushed, often by legal groups with a requirement that an attorney be hired to represent the poor victims. While this representation approach is well received, in no small part due to the smooth-talking litigators pushing it, little is actually done for the resident other than delay the inevitable if they haven’t paid the rent. The result doesn’t change, but the lawyers get paid. Some communities are focused on interventions prior to evictions, especially for families with children facing financial hardships. Typically, the hardship is automotive, health or job disruption related. Unlike the poor choice / addiction issues detailed in the book Evicted, Social Workers are able to determine who is a viable candidate for support. The long-term tracking suggests that this type of support is having an appreciable difference in those families’ outcomes. no doubt require yet another round of clarifications, such is the nature of the regulatory beast. However, the clarifications for the most part are nuanced issues that should not cause the average investor heartburn. The real key on all of this is to remember the hard dates in place for funding your Qualified Opportunity Fund (QOF) and preparing to meet those deadlines with the purchase, and then having the rehab or construction plan in place for the next 30 or 31 months, respectively. Two key requests that have been made are extending the compliance time from 30 and 31 months (which are not long enough for some communities) and a request to move beyond the hard calendar dates to more workable project deadlines. Hopefully those will be modified or at least waivers will available. Having said that, the message has been consistently shared from Treasury that Opportunity Zone participants that are keeping the spirit of the law, will be allowed to come into compliance with the regulations, once they are developed. Don’t wait, get involved! Emotional Support Animals (ESAs) This is issue is one more thing that HUD is “working on”. Please forgive my air quotes, but we’ve been hearing this response for over a year now with no sign of relief. The recent story of the alligator as a comfort animal (check out www.realestateinvestingtoday.com for details.) further proves the point of the growing ridiculousness of this regulatory albatross. Tax Extenders Mortgage Debt Relief Forgiveness is one of the numerous existing temporary tax policies that expired in 2017. Over 60 various trade associations (including National REIA) are working in a coalition to move these critical niche policies through both the House Ways and Means Committee and hopefully matching up with the Senate bill 617, sponsored by Senators Grassely (R-IA) and Wyden (D-OR.). With numerous new members of the Ways and Means Committee, and the House in general, there will be a learning curve that will likely require substantial grassroots support – more to come on that front! n Late February, Oregon Governor Kate Brown signed a landmark first-in-the-nation rent-control bill, SB 608, which she said which provides protections for renters related to nocause evictions and rent increases. “This legislation will provide some immediate relief to Oregonians struggling to keep up with rising rents and a tight rental market,” the governor said in a release. “But it does not work alone. It will take much more to ensure that every Oregonian, in communities large and small, has access to housing choices that allow them and their families to thrive,” Brown said in the release. The Governor’s 2019-21 budget includes $400 million in new investments aimed at ending homelessness for Oregon’s children, providing permanent supportive housing for the chronically homeless, housing Oregon’s veterans, and accelerating the growth of housing supply by tripling the existing pipeline of affordable housing by 2023, according to the release. 'A Lot of Headaches' Ahead? Brown has made affordable housing a priority, but cautioned the bill could lead to “a lot of headaches” if not paired with a $20 million funding package, according to reports. The funding package included in Brown’s proposed budget, for instance, would pay for technical assistance in the form of a help line and legal aid for landlords and renters, according to the Statesman-Journal. Oregon Democrats released a statement saying the legislation will “protect renters from rent-gouging and no-cause evictions. State Senate Bill 608 “creates a fairer system that will provide predictability and stability to renters throughout the state, while not discouraging new construction,” the statement reads. Oregon Governor Kate Brown says the landmark rent-control bill provides protections for renters related to no-cause evictions and rent increases. them to no more than 7 percent plus the consumer price index during a 12-month period. It would also ban no-cause evictions following the first 12 months of occupancy. Erodes private property rights and fixes nothing Oregon’s House Republicans released a statement saying, “It is evident supply is necessary to alleviate the affordable housing shortage. “Passage of this bill also raises a more serious question: If a property owner can’t decide who lives in their apartments and houses, who really owns the property? Certainly, it is no longer the one who pays the property taxes. “Moreover, the bill doesn’t address the real problem, the supply of affordable housing. The super-majority party contends the legislation will rein in rising rents caused by a housing crisis. “But over and over, rent control in cities across the country has demonstrated otherwise. The answer to the housing crisis is not rent control, the answer is increasing the available number of houses and apartments. SB 608 neither encourages the building of new housing supply, nor does it provide real incentives to maintain existing rental property. “Investment dollars that would have provided more housing will now go elsewhere. The Democrats’ unwillingness to seriously consider common-sense amendments will damage the mom-and-pop property owners, many of whom have invested their retirement dollars into the rental market. “The consequences of this legislation will ripple far beyond the urban areas to Oregon’s small communities, where the housing shortage is just as real as in urban areas. It is also an assault on private property rights, effectively removing property owners’ ability to do what they wish with their own assets. “This bill is just one of many aimed to further regulate Oregonians, while doing little to solve the problems it purports to fix. The virtual elimination of single-family zoning ensconced in HB 2001 and the explicit promise in HB 2020 of a new “economic system” for households, businesses and workers demonstrate the true intentions of Oregon’s ruling party,” the Republicans’ statement said. Warnings of Negative Consequences of SB 608 “There is no doubt that housing affordability is a crisis in Oregon. However, SB 608 will worsen the imbalance between housing supply and demand by allowing for rent control across the state,” said Doug Bibby, President of the National Multifamily Housing Council, in a release. “While the intent of rent-control laws is to assist lower-income populations, history has shown that rent control exacerbates shortages, makes it harder for apartment owners to make upgrades and disproportionately benefits higherincome households. “That is why Oregon and a majority of other states have laws in place that explicitly prohibit local municipalities from implementing rent-control laws. Reversing course is counterproductive and will not solve the crisis. “Oregon lawmakers should focus on holistic solutions that encourage more housing supply, facilitate public-private partnerships to tackle many of the existing barriers, and increase direct assistance to renters,” Bibby said in the release. “Today’s regrettable action by the Oregon State House of Representatives on SB 608 will lead to unintended, but pre-eminently predictable negative consequences for housing affordability in the state,” said Robert Pinnegar, CAE, President and CEO of the National Apartment Association, in a release. “Rather than focusing on the onerous regulatory environment that constricts the diversity of housing needed to meet the surging demand for rental housing, Oregon’s public officials chose to slide backward by enacting a failed policy that has historically proven to hurt residents and housing supply alike. “The National Apartment Association and the National Multifamily Housing Council will continue to promote sustainable, responsible solutions that lead to more apartment construction, and oppose reckless and ill-advised policy approaches like rent control,” Pinnegar said in the release. Published quarterly for chapters, associated real estate investor associations, their members and guests. 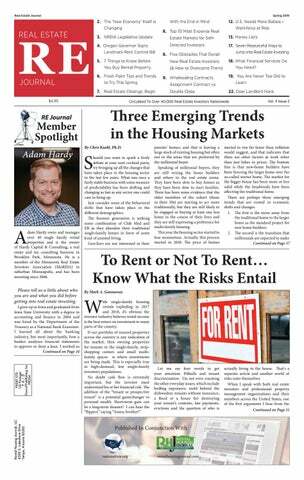 Publisher John Triplett john@rentalhousingjournal.com Editor Linda Wienandt linda@rentalhousingjournal.com Advertising Manager Terry Hokenson terry@rentalhousingjournal.com The articles in RE Journal written by all authors are presented to you for educational purposes only. The authors and the National Real Estate Investors Association strongly recommend seeking the advice of your own attorney, CPA or other applicable professional before undertaking any of the advice or concepts discussed herein. The statements and representations made in advertising and news articles contained in this publication are those of the advertiser and authors and as such do not necessarily reflect the views or opinions of National REIA or Rental Housing Journal, LLC. The inclusion of advertising in this publications does not, in any way, comport an endorsement of or support for the products or services offered. To request a reprint or reprint rights contact Rental Housing Journal, LLC, 4500 S. Lakeshore Drive, Suite 300, Tempe, AZ 85282. (480) 454-2728 - (480) 720-4386. © 2019 All rights reserved. Editor’s note: Mr. Dornish resides in Pennsylvania and, as such, occasionally makes references to Pennsylvania law. Please check with your local laws and ordinances as they differ from state to state. By Bradley S. Dornish, Esq. ost of the time, we do not buy rental property which is vacant. We buy with at least some existing tenants, so we can enjoy immediate cash flow from the property. Banks generally prefer to loan against existing cash flow, instead of taking your projection as to the rent you think you can get, and assuming you will rent immediately in February. But the Seller of the property who was thinking about selling last March, who listed in July and sold to you in October reasonably anticipated that he would not be the landlord for too much longer when he rented units in April, June and September. He knew that full occupancy meant top dollar and did not want to hold out for the ideal tenant and risk losing a sale. So who are those tenants who moved in over the last few months? What are their incomes, credit scores and criminal records? Would you have rented to these folks if you had already owned the building when they applied? Are they paying their rent on time every month? within days of taking over. Maybe they hadn’t gotten my letter with the self addressed envelopes to send their rent checks to the right address. Maybe they hadn’t seen the signs I posted in every building with the new address and contact phone numbers. I opened the tenant files and started to call the tenants who hadn’t paid. Some numbers were bad, some didn’t answer and a few who did told me they had moved out. The Seller blamed my letters and rules for scaring some of the good tenants away. He also suggested that I’d get more rent if I visited the units in the first few days of the month and knocked on doors. Many of the tenants, he said, liked to pay cash at their own front doors, and if you didn’t get it within a few days, they would spend the cash on other necessities like food, utilities and drugs (hopefully meaning prescriptions). I started to visit the units the next weekend, and confirmed ten more vacant units. Since it was the second week of October, I knew I was in for a long and expensive winter. Some of the tenants I did meet complained that they weren’t paying until their heat, plumbing or other problems were fixed, and others told me Section 8 paid their rent in full, though I had received a Section 8 check for those buildings already, and the additional tenants who claimed to be on Section 8 were not listed on the check. and the mortgages. I never did have the cash flow to keep up with the taxes on those units, and went into my pocket to keep the gas and electricity on. I was glad I didn’t lose more when I gave the properties back to the Seller. He still owns them, but I think issues with management of those tenants in those units were a major contributing cause to his bankruptcy. At least I wasn’t the one forced into bankruptcy by having the wrong tenants. pring is the perfect time to refresh yourself on the latest tips and trends in the world of paint. From large interior-room remodels to small touch-up work, paint has an impact on a wide variety of projects. Regardless of whether the job is small or large, staying up-to-date on the latest trends, tools and technologies will help ensure your team is painting efficiently. Try the following five tips and trends to ensure your team is following the best paint practices. 1. Stay on Trend Paint is a great opportunity for pros to use their imagination and serve as trusted, creative resources for clients who are unsure of their optimal look. During the consultation process, ask your clients what feeling and energy they would like for each renovated room or component. Brands like BEHR have made it easy, with their interactive guide of trendy shades for the year, helping you start the conversation and provide valuable creative insight. The annual Color Currents collection features 20 limited-edition colors that are interchangeable for every space, and offer “composed,” “comfortable” and “confident” color buckets to match a variety of room styles. For example, the comfortable palette features muted pastels like “Peek a Blue” and “Life is a Peach” for a sophisticated, feminine feel, while the confident palette features adventurous, bold colors like “Jade Dragon” and “Fired Up” for accent walls and other dramatic points. convenient and affordable when replenishing supplies for the current job or revisiting older jobs at any location. and durable paint job. Without the correct primer as a base, you risk a paint application that either does not adhere to surfaces or lacks the proper sheen. Several brands have also introduced primers featuring integrated odor- and mold-killing agents. When applied, these reinforced primers offset smells from pets, smokers, mildew or other unpleasant scents that may have seeped into the wood over time, which is particularly useful for older properties. Be mindful of the visibility of the project location when choosing the best type of paint. For a full-scale remodeling job in a prominent area of the home, choose a top-quality option like BEHR’s Marquee brand. This versatile paint requires one coat and provides advanced dirt and fade protection, preventing the need for follow-up applications and return trips to the job site. It’s also ideal when working in occupied spaces to minimize the job time and hassle for clients. For smaller jobs and touch-up work, choose a more budget-friendly option like BEHR Premium Plus, which seals both uncoated and previously painted surfaces to create a finish that resists mildew, stains and moisture. Beyond improved color and performance, paint also has become significantly safer in recent years. Clients, especially those with children, may have questions about the environmental safety of paint, such as Volatile Organic Compound (VOC) levels. According to the EPA, VOCs include chemicals that may have adverse health effects. The good news is that all of The Home Depot’s latex-based paints are low- or zero-VOC, and ensure healthy indoor air quality for homeowners and their families. 5. One-Stop Shop Whatever your project, time is of the essence. That’s why The Home Depot has upgraded its paint offerings and services to make the evaluation and purchasing process more convenient. More than 200 Home Depot stores now include a BEHR Pro Paint Specialist dedicated to answering your questions and ensuring you receive the right products and guidance for your needs. For orders over 24 gallons, The Home Depot will deliver directly to the job site, easing transportation and logistics concerns while improving order accuracy. Plus, you can purchase all your supplies in one place, choosing from a variety of top brands in everything from paint supplies to hardware to tools. Knowing the trends and having the right tools will ensure your client’s visions and desires are met. Keeping up with the latest trends and having the right tools in your toolbox, both mentally and physically, will help guide your crew and make a lasting impression for your client. Jud Walford has more than 34 years of experience in the home improvement industry, including more than two decades with The Home Depot. He held various roles, including store manager, district manager and regional merchandising manager, before assuming his current duties as the company’s Pro Paint Merchant – a position he has held for several years. document in a real estate closing is something called a Closing Protection Letter. This letter is essentially an agreement from a title-insurance company to a lender or other party putting money into escrow indemnifying that lender or party against any issues arising from the closing agent’s errors, fraud or negligence. The big legal word for this is “defalcation,” when a closing agent misappropriates funds, conceals the fraud, and skips town. If the closing agent would misappropriate the funds, the title insurance company has agreed in writing to make the necessary financial remediation and reimbursement. If you are putting money into escrow as a private lender or as a cash buyer, it is absolutely essential that you obtain a closing protection letter so you have a layer of insurance to protect you in the event the closing agent or one of their employees steals the money and disappears. At the end of 2018, I was reflecting on a couple of real estate closings in which I was involved for my own investments. In my mind, these closings should have been simple, but they were filled with all sorts of complications. After analyzing why, I realized it was due to my failure to clearly communicate how I envisioned the closing to look. I understood the necessary steps of the transaction, but I failed to clearly explain those steps in a cover letter or in the Purchase and Sale Agreement. I presumed the closing agent would understand. When putting together a transaction, begin with the end in mind, and make sure every step is clearly disclosed to all parties involved. This will make for a successful closing with no unexpected complications. Jeffery S. Watson is an attorney who has had an active trial and hearing practice for more than 25 years. As a contingent-fee trial lawyer, he has a unique perspective on investing and wealth protection. He has tried over 20 civil jury trials and has handled thousands of contested hearings. Jeff has changed the law in Ohio 4 times via litigation. Read more of his viewpoints at WatsonInvested.com. credit reports, containing all kinds of financial information, and available only with prior written authorization from the tenant, are needed to close the loop. Hopefully, your seller keeps a file on each current tenant which includes the credit authorization signed by the tenant and a report obtained thereafter by the landlord. If your seller doesn’t have a credit report on each tenant, be concerned. Tenants with bad credit histories flock to landlords who don’t check credit, and you are likely to have more than your fair share of evictions if the tenants in the building you buy weren’t properly screened. You can wait until you sign an agreement of sale to get the tenant files, but make sure you get and review them before you close. lie about receiving rent, Tenants can lie about paying rent, but the bank statement will show what the landlord deposited and when. It will also show real expenses in the month, but that is a point for a different article in this series. If you follow all of the recommendations in this article, you are far less likely to have to evict the tenants you inherit when you buy a building. It may take extra time up front, but an ounce of prevention is worth a pound of cure! Bradley S. Dornish is a licensed attorney, title insurance agent and real estate instructor in Pennsylvania. He can be reached at bdornish@dornish.net. nancial services company that enables individual investors to diversify investment portfolios through alternative asset classes, including real estate, tax liens, private equity, cryptocurrency, and precious metals. Our tax-advantaged, self-directed investment accounts appeal to entrepreneurial investors who want to take control of their wealth. We offer clients a robust account management system and wealth-building education, which enable them to grow their knowledge and complete transactions with ease. Equity Trust is a passive custodian and does not provide tax, legal or investment advice. Any information communicated by Equity Trust is for educational purposes only, and should not be construed as tax, legal or investment advice. Whenever making an investment decision, please consult with your tax attorney or financial professional. coached. Then I identified 5 stubborn obstacles that can derail new investors from their real estate goals. But the point of what you’re about to read isn’t all doom and gloom. Instead, my goal is to help you become more aware of the obstacles so that you can prepare yourself mentally and emotionally to overcome them. Now let’s get into the 5 obstacles! Obstacle #1 – A Confidence Deficit Michael Jordan was arguably the best basketball player ever. When the game was on the line, he wanted to ball because he knew he could win the game for his team. You could see the confidence in his face. But how did he become confident? Was he born with it? I don’t think so. Jordan did have talent. But his confidence to hit the game-winning shot came from thousands and thousands of practice shots. He knew he could hit the shot because had prepared ahead of time. As a new real estate investor, you can do the same thing. I’ve found that your preparation as a new investor should focus on three primary areas: 1. Knowledge: Entrepreneurship is essentially a game of ideas. So, educating yourself is always a primary, necessary step to build confidence. First of all, you should educate yourself about your local real estate market. You can begin with my Guide to Pick the Ideal Location For Investment Properties. oday’s most prolific wholesalers already know it, and it’s about time you did, too: There are essentially two ways to profit from a wholesale real estate contract. More specifically, the two most common ways to close a wholesale deal are selling the contract, otherwise known as the assignment-of-contract method, and a double closing. While the two approaches share some similarities, their differences are worth noting, and could mean the difference between success and, well, failure. If you want to tip the wholesaling scale in your favor, I highly recommend you familiarizing yourself with the differences that exist between an assignment of contract and a double closing. The Office Depot name and logo are the registered trademarks of The Office Club, Inc © 2018 Office Depot, Inc. All Rights Reserved. 5 Obstacles That Derail Real Estate accounts, and lease options. Then go out and ask your lenders, partners, or other sources of financing if they will put up the money. Knowing you have access to money is a critical source of real estate investing confidence. 3. Team and Community: It’s possible to borrow confidence from others. After all, we humans are social creatures. It’s how we’ve survived as a species for hundreds of thousands of years. As a new real estate investor, be sure to focus on building a team of confident, experienced, and competent individuals. Their knowledge and skills can compensate for your own deficit of confidence. all seem important to me. But on the other hand, I also know that we’re all given the same 24 hours in a day. Like investing money, we all choose to spend our time on certain things. So, wise use of time basically comes down to our daily choices. To improve those daily choices, I’d started by learning to differentiate between the urgent and important things in your life. Too often people are busy, but they’re not productive on what really matters. Then work on batching the activities of your day into distinct 1-2 hour periods. The practice of batching takes advantage of the 80:20 principle and Parkinson’s Law, which are foundational principles of personal productivity. Little by little, you can regain control of your time. And then you can use that time and your energy on important goals like real estate investing. Equity Trust Company, a Self-Directed IRA Custodian, offers National REIA Members over $500 of Wealth Building Education & Tools for FREE! *$205 is your minimum savings, actual savings could be greater depending upon account value. $50 set-up fee still applies. Learn more by calling 844-732-9404 or by visiting www.TrustETC.com/NationalREIA Equity Trust is a passive custodian and does not provide tax, legal or investment advice. Any information communicated by Equity Trust is for educational purposes only, and should not be construed as tax, legal or investment advice. Whenever making an investment decision, please consult with your tax attorney or financial professional. © 2018 Equity Trust®. All Rights Reserved. yourself how to use these tools, and then pull them out when you need them to build your real estate investing portfolio. If you’re a new investor struggling with overwhelm because there are so many interesting angles in real estate, I recommend going through the process in my article Real Estate Investing For Beginners – How to Find Your Focus. Obstacle #4 – The Gap Between Theory and Reality Theory is reading and understanding the concepts in a book (or a blog post!). But reality is applying what you learn in the real world. This is a tough obstacle that we all face when we do something new. As hard we teachers try, we can’t do it for you! But I do have two tips that might help. First, embrace the idea of imperfection. When you were a baby learning to walk, you fell hundreds of times. If you had been a perfectionist back then, you would have quit long before you took your first step! As a new real estate investor, you’re going to be imperfect. You’re going to stumble through your first several dozen attempts to run the numbers of a deal. You’re going to stutter and not know what to say when negotiating with a seller or real estate agent. And you might even do like me and purchase a loser rental property! It’s ok. We all make mistakes, and no one begins perfectly. Merging theory and reality is a process of continuous “failures” until you finally get it. Second, just take baby steps. You can avoid fatal mistakes as a new investor if you don’t try to do too much, too fast. If you’ve never done a deal before, just do ONE deal. Then pause and learn from it. If you’ve never made an offer on a property, just make ONE offer. Then pause and learn from it. Toddlers walk painfully slow while learning. And new real estate investors move slowly too. It’s all part of the learning process. Just accept it and embrace it! first of which is that most important cash flow. But all good things come with risks and as I have stated above, they come in many forms and fashions in the renting environment. Mark A. Gannaway, CPCU, is the Chief Executive Oﬃcer and Founding Partner of Arcana Insurance Services, an all-lines property and casualty managing agency that’s been working with real estate investors since it was founded in 2005. Arcana Insurance Services offers National REIA members multiple insurance products specifically designed for Investors and their tenants. Learn more by visiting www.nreia.arcanainsurancehub.com. mericans need to put their family plans into high gear. The CDC is reporting that the U.S. birthrate has fallen again and is now well below the level needed to replace our population. Having a low birthrate can cause major problems for an economy when there are too few workers to fill jobs. As real estate investors, we know that the housing market depends on a strong economy and job growth, and job growth depends, in part, on having an adequate workforce to fill all those positions. The Centers for Disease Control birth rate report for 2017 shows it slipped another two percent. That brings it down to just 1.7, which represents the average number of births by each woman of childbearing age. A nation needs a birth rate of 2.1 to sustain itself, or 2.1 babies for each woman during their lifetimes. applicant negotiating for higher pay, but it’s not great for the economy. So, yes, we are already experiencing a labor shortage, and, now, this population decline could make it much worse. Another missing piece to this workforce puzzle is why the commander-in-chief would want to create even more jobs when we don’t have enough workers. The Tax Cuts and Jobs Act of 2017 was designed to cut corporate taxes so companies could hire more people, but where are the people to hire? There’s nothing wrong with job creation, but it needs to be addressed in context with an adequate number of talented workers to fill those jobs. A year ago in December, The Washington Post published an article called “2018’s challenge: Too Many Jobs, Not Enough Workers.” It starts off: “Employers nationwide are grappling with a problem that threatens to stall economic growth: vacancies -and lots of them.” And what does that mean? Unless you boost productivity or employ the use of technology, like robots, to do some of the work of humans, the economic engine is going to falter. We’ve already been witnessing what happens in the housing construction industry when there aren’t enough workers. Labor expenses rise, and delays occur when builders can’t find the help they need. Or when disaster strikes, victims have to put their rebuilding plans on hold while they wait their turns. Supply-side labor shortages, such as a lack of truckers to deliver goods, could also affect the construction industry. According to the Post article and the American Trucking Association, the industry needs another one million drivers in the next six years to replace those who are retiring. balance this kind of shortfall -- so what is Japan doing to address its labor shortage? One official told NPR, “To help ensure Japan stays on a path of sustained economic growth, we know we must address the birthrate and aging population issues.” Last year, Japanese lawmakers issued a new economic policy package to help solve the problem. Changes include more support for working families who need daycare, and a better work environment for women with children. The government is also promoting the use of robots to help fill jobs. The International Monetary Fund published an article last year called: “Land of the Rising Robots – Japan’s combination of artificial intelligence and robots may be the answer to its rapidly shrinking labor force.” Japanese lawmakers are also hoping to attract immigrants. They just approved legislation that creates a new visa category for foreign workers. Starting on April 1, it will allow an additional 345,000 foreign workers into the country for both highly-skilled and low-wage jobs. Are We Doing Enough to Fix This? Are they doing enough to solve the problem? Even more important – Are “we” doing enough to solve our own problem? We may have an issue with illegal immigration, which needs to be addressed with or without a wall. But this isn’t a commentary on immigration reform. It’s an attempt to bring attention to the need for workers, now and in the future. People coming in from Latin America could help solve that problem. We only need to give them a legal means to do so. But that’s just one piece to the labor shortage problem. The birthrate gap is an important issue that is not getting enough attention. We need to have a public conversation that will help lead us to a solution before it snowballs into a major crisis, and makes whatever labor shortage we’re having now, much worse. Kathy Fettke is the Co-Founder and Co-CEO of Real Wealth Network. She is passionate about researching and then sharing the most important information about real estate, market cycles and the economy. Author of the #1 best-seller, Retire Rich with Rentals, Kathy is a frequent guest expert on such media as CNN, CNBC, Fox News, NPR and CBS MarketWatch. Donna Behrens has worked as a TV news writer and segment producer in the San Francisco Bay Area for more than 25 years. She is a podcast producer and writer for the Real Wealth Show and the Real Wealth News for Investors. Learn more at www.RealWealthNetwork.com. great job you’re doing. That’s because that isn’t urgent. So we spend 100 percent of our time taking orders, or dealing with problems that our customers bring us. This is reactive work. We are at the total mercy of what’s incoming. If the right inquiries come in, we will grow. But if they don’t, we won’t. It’s totally out of our control. But if we spend a few minutes each week proactively thinking through who to call and follow up with – and then actually make those multi-minute follow-ups – we are now in complete control of our growth. We are being proactive. We are in front of our customers when the competition is not. We are showing them we care. We are present. We are interested. And that’s all they really want. And they will thank us with their money. Make your money lists. And enjoy the sales growth. Alex Goldfayn is the author of the 2018 Wall Street Journal Best Seller Selling Boldly. Learn more about his revenue growth consulting work – which always adds 10-20% sales growth annually for his clients – at www.Goldfayn.com. a Bank Examiner for six years during which time I became a Certified Public Accountant (CPA). When I left, I started my own tax practice and after a year sold my business to a larger firm and worked for them for five years. A majority of my tax clients came from the investing world and many from our local MnREIA. I owned and rented about 10 properties, but in 2015, on my son’s first birthday, I decided to make the leap into full time investing and haven’t looked back. Where is your current market and what is your focus or area of expertise? My current market is in the northwest suburbs of Minneapolis. I specialize in buying distressed and foreclosed single family homes and townhouses. I find properties by searching foreclosure listings and wholesale lists. Rather than using a property management company, I like to rehab the properties and rent them myself. That way I can get a better sense of my tenants by meeting them in person. My dad owns property in Iowa and I always told him I would never own rentals as I seemed to be doing all the gross and dirty jobs when I worked for him during the summer (trash detail, cleanouts when tenants left). I realized later that when you actually own them, you pay other people to do the gross stuff! I ended up buying six houses before I got married, three in my hometown in Iowa and three in suburban Minneapolis. I started with just a simple excel spreadsheet to track them and that has now grown to 10 LLC holding companies, which I now track in Quickbooks with class codes. Describe a typical work week for you as a real estate investor. I usually do some bookkeeping items in the early morning, check on the jobsite, buy materials, swing a hammer if necessary, watch my kids in the afternoon. Hopefully I won’t get any emergency phone calls from tenants. I usually work 30-40 hours and if things are going smoothly, I might have time to review my foreclosure lists and make phone calls to find the next deal. Rental property allows a nice reoccurring income so finding a deal isn’t necessarily on the top of my list as opposed to a flip - in which case you have to find your next project or you might not have income for a few months. How long have you been investing in real estate? Tell us about your first deal. I purchased a foreclosed townhouse in 2006 to fix up and live in and then ended up finding another foreclosed townhouse within the same association. They wanted $120k, I offered $100k expecting to meet in the middle, but when they came back at $104k, we had a deal. The only problem was the down payment. I called my dad and he offered a line of credit in my name but secured by one of his properties. I had a good job as a bank examiner so I paid down the line fairly quickly and used it to buy my next house in my hometown for $15k. I repeated the process, but also had a very good community banker that would use “after completed” appraisals to get my purchase and rehab money up front. How do you fund your investments? I’ve lived in three of my rentals and took out home equity lines of credit on each one while living in them. I utilize lines of credit to pay cash for properties, rehab and rent them. Then I request a loan from my local community bank to get all my money back, payoff my lines and start the process again. It saves time when purchasing because you don’t have to wait for an appraisal and saves money as you don’t have two separate loan fees for the purchase and refinance. I do not. I don’t see the need for it as I haven’t purchased anything off the MLS in the last 5 years and I don’t plan to sell any properties in the near future. Ice fishing on one of Minnesota’s famous 10,000 lakes. owners that wanted ranch/rambler style homes for assisted living residents. I found a house that met their needs and probably paid too much for it, but I am finishing the basement and adding a fourth bedroom and second bathroom. The increased square footage should add enough value and allow me to get most of my money back after the refinance. I’m buying a similar style house in March for the same group for a much lower price. The two investments together will make a nice monthly return and I will have a great equity position. How much time do you put into your real estate education? one of the gurus. Dyches Bottiford and John Hyre have been my current favorites as they focus on tax strategies and self-directed IRAs. Left: A remodeled kitchen in a recent flip that is now a rental. Below, clockwise from far left: A remodeled house that later became rental property; a home that Adam purchased and flipped after answering an ad on Facebook to buy a washing machine (the home was later sold on contract); and another flip – the stucco siding was removed and replaced with vinyl windows and new siding. It was later sold on contract and Adam continues to get residual income each month on the interest rate spread. started, he helped guide me on what questions to ask prospective tenants and to always trust your “gut” when listening to their answers. As my business has grown, I’ve learned a lot from a private lender/ foreclosure expert in our area. He taught me about the foreclosure laws and ways to get cheap properties before they hit the MLS. What are your current and future goals? Currently my goal is to spend more time with my kids. They are ages 4 and 2, and I want to spend time with them before they get into school full time. I quit my CPA job and grew my rental portfolio so I could work less and have more flexibility. For the future, I’m looking to grow my self-directed Roth IRA. I have to believe that our government will end up raising tax rates at some point to combat the national debt level and I want to be protected from that with a Roth IRA. What has been your top struggle in this business? It’s been shutting my phone off and focusing on my family. With email and text messaging, tenants can always get a hold of me and want an immediate response. Finding the next deal. Whether it’s my foreclosure lists or wholesale contacts, it’s always great to find a property that few others have access to. Do you have a tip or advice that you would pass along to other investors? Start small. Buy that first house in your own name. See if you like flipping or being a landlord. If you like it, then get a LLC or S-Corporation and grow. As a CPA, I saw so many people pay $25k for a real estate class and pay to form a Nevada Corporation and then never actually buy a property. Figure out if you actually like real estate before you spend that kind of money. How important is joining a local REIA to a new investor? It’s been huge for me. I joined July 2012 and started asking if anyone was selling properties in the suburb I lived in. One guy gave me his card and I ended up buying four properties from him over the next 18 months. He’s been a huge part of my success. The people you network with at a REIA are awesome and I’ve learned so much. We all want a good deal, but also want to see others succeed, so it’s been a very positive experience to learn from some of the more seasoned investors. What is your favorite selfhelp or business book? I read Rich Dad Poor Dad, by Robert Kiyosaki in December, 2012 and ramped up my business in January, 2013. I think it really gave me some clarity in what direction I wanted to go with my investments and why I wanted to get into real estate. I also just read Lifeonaire by Steve Cook and Shaun McCloskey. It helped give me some perspective on how to spend less so I can work less. Do you have any interesting hobbies or something unique that you like to do? was a blast, although we didn’t catch any fish…. Can’t wait to go out again! What social media can others find you on? Join us on our 23rd Annual Winter Cruise Conference on the ship that was designed to leave the future behind. The ship departs from Ft. Lauderdale with stops in San Juan, Tortola (NEW PORT) and St. Maarten. Over the course of the week, you’ll learn the secrets of successful real estate investing and how to apply those to your business strategy in 2020 and beyond. includes the conference fee, government taxes and gratuities. ow many hours every week do you spend driving around for potential clients? Is this truly the life that you have been dreaming about? Here’s the thing: For years I kept my real estate license alive and well; however, I no longer use it in order to bring in an income. No, I have not given up on real estate entirely. I just learned how to make it work for me, instead of me for it. Now I teach other women how to build their income through real-estate investing so they, too, can live life their way. Ready to learn more? Great. Let’s dive in. 7 Resourceful Ways to Jump into Real Estate Investing If there is one thing I love about real estate investing it is that there is something for everyone. What is a good fit for one person may not be right for someone else, so it is always a good thing to try out your options and see what works for you. Here is a list of seven resourceful ways to get started as a real estate investor. 1. Rehab & Flip Rehab & Flip is likely the most well-known method for real estate investing. The shows on TV have certainly given voice to this common option for buying low and selling high. If you are someone who likes to get your hands dirty and break a sweat (or find people to do it for you), this might be a great option for you. If not, though, no sweat (pun intended). There are more options for you to consider. happy to pay your price because they will eventually get it back in return. Two simple agreements on your end, and you make a cool $10k. No rehabbing, sweat, labor, or stress. Be mindful that you need to check the state and local laws in your area about this option. Some states require a slightly different setup to maneuver a deal like this, so do your due-diligence and research your requirements. 3. Single-Family Rentals (SFRs) Now, there are various ways to work with singlefamily homes and rentals in general. My preferred method is with lease options and owner financing. This way I have no out-of-pocket expenses and I add cash flow quickly. Single-family rentals appeal to a wide array of people, so finding tenants is not usually too difficult. Some options you can consider in order to finance the property are a standard mortgage, owner financing, and private-money lending. Determine what plan of action you want to use, and then get started on the steps to carry it out. 4. Multi-Family Property Potential I just explained a bit about single-family rentals, and the same is true with multi-family properties. The biggest difference, however, is the profit potential from multiple tenants at once. While I do not necessarily recommend this for a first property, it certainly is a possibility if you are ready for the responsibility required. Remember, not all multi-family properties have a ton of units. Duplexes, triplexes, and fourplexes all fall under residential real estate, even though they are multi-family properties. If this is an option that interests you, start small and then grow larger as you feel more confident in the process. have a problem paying a fee for such a convenience. Do your research and have a plan, but do not overlook the potential that land offers. 6. Short-Term Vacation Rentals Now, this is a fun one. Just recently I launched my very first short-term vacation property and I have had so much fun with it. Short-term vacation rentals are booming right now. With AirBnB and high-stress living, the culture is ripe for a small slice of heaven where they can go for a break and some relaxation. If you are interested in providing a sanctuary of sorts to renters, but focused on short-term contracts, vacation rentals might be a great fit for you! 7. Hire Out While I have already given you six different incomebuilding options, this final one is more for practical sanity purposes Far too many people are tempted to nickel and dime their investment property by doing all of the work themselves. I do not recommend this. You have to think strategically here. The more you can outsource the work involved in cleaning up and preparing a house, or maintaining it once tenants are in, the more available you will be to find and invest in more houses. This is why I always work with a local handyman near the property location. Build relationships with these gems and use them as often as needed for work around the property. Build Your Portfolio and Grow Your Income You may never have given real estate investing a thought, but I hope I’ve given you some things to consider. Real estate is such a fun and fascinating way to grow your income, and I hope you will give it a shot! No matter which option you decide to follow, you now know there are creative ways to jump into real estate investing, no license necessary. Take a chance. Give it a shot, and see the benefits start rolling in. Whitney Nicely rejected the Southern-girl path of working at her family’s trucking business and embraced the life of an investor. Her first nine months made her over $140k, and set her on the path to empowering other women to break into the real estate “good ‘ol boys club” and break down barriers while making some serious cash. She was the featured REIA member in the RE Journal’s “Member Spotlight” in the Spring, 2016 issue. Learn more by visiting www.WhitneyNicely.com. in lawns and all the maintenance that involves. The millennial does more small scale entertaining and when they have families, they are small. They are more mobile and want to either rent or buy something that can be sold quickly and easily. Thus far economic issues have been relatively benign and the housing market thrived for many years. The question now is whether higher rates of inflation and perhaps a recession in 2020 will trigger a negative reaction in housing. These shifts have only started to manifest and the threats may stall but for now they are worth monitoring. Chris Kuehl, PhD., is an economist and Managing Director of Armada Corporate Intelligence. Visit www.armada-intel. com for more information. mall business owners are often told they should hire help for their finances, but how do you know what kind of help you need? The words accountant, bookkeeper, and bookkeeping service are thrown around quite often, but it can be difficult to determine who exactly you need to hire. One of the most important things to realize is that bookkeeping and accounting are not that same; while both help you with the financial side of your business, each job has its own unique distinctions that can help you decide who you need to recruit. What is the diﬀerence between a bookkeeper and an accountant? In short, a bookkeeper generates your business data. What this means is that your bookkeeper is the person who handles the recording of financial transactions, such as purchases, receipts, sales, and anything else of the like. The job might sound simple, and sometimes it is just that easy, but it depends on the bookkeeper you hire and the scope of his or her work. There are a number of tasks that a bookkeeper could complete by property: • Entering all hard-money and soft-money loans • Recording invoices and payments received • Maintaining your payroll system • Preparing the initial financial statements • Managing accounts receivable and accounts payable • Calculating sales tax • Managing your company’s accounting systems A bookkeeper will likely be the person who assists you with the ongoing financial recording and transactions that keep your business running smoothly. Many businesses (especially small businesses) use accounting soft ware such as QuickBooks to take care of recording their financials; a lot of bookkeepers will be wellversed in using such soft ware, and it is probably best to implement it into your company’s financial routine. an accountant is more consultative and analytical. Apart from general financial analysis and advice, an accountant can offer other services: • Recording purchase, refinancing and sale HUDs • Internal or external audit • Tax consulting and planning • Corporate reporting • Preparation of financial statements Accountants who prepare incometax returns should have a firm understanding of taxation requirements so they can assist you with taxes as well as advise you on tax strategy. There is more, of course, but this gives you an idea. Whereas bookkeepers are responsible for recording the data, accountants are responsible for verifying and analyzing the data in order to create reports, do audits, and prepare records like income statements and balance sheets. Accountants are essential to your business because their insight can provide forecasts, predict trends, and identify the best opportunities to grow your company. If your accountant is the one doing your bookkeeping, you should know that you might be paying more than you should. You will probably pay a higher hourly rate for accountants than for bookkeepers, so if this is the case for you, you should look into hiring a bookkeeper to work with your accountant. Speaking of working together, it is critical that as a business owner, you understand that accountants and bookkeepers come hand-inhand; when they are able to work in conjunction with one another, your financial requirements are typically not merely met but exceeded. It is nearly impossible to benefit from one service without the help of the other, so if you do not have a bookkeeper and/or an accountant on your team, start looking to hire. each specialize in their own areas of expertise. Most bookkeeping services offer a three-tiered approach consisting of an accounting soft ware specialist, a full-charge bookkeeper, and a controller. Each of these roles serves a specific function that adds value to your financial routine: • Accounting soft ware specialists construct a unique data file that suits the needs of you and your business. The specialist makes sure that you always have access to the soft ware, data, and reports that you need. • Full-charge bookkeepers track your company’s payables and receivables all while recording all of your business’ transactions. While it sounds simple, there are several responsibilities that a full-charge bookkeeper needs to handle. • Controllers boost the financial accountability of a company. Controllers review the work of bookkeepers and also manage the security of a data file so that the data cannot be edited without approval. On top of all of this, controllers also issue monthly financial reports that let you know what you need to address. Controllers help you with processes, procedures and workflow to increase your cash flow. So, in short, a bookkeeping service divides the job between three employees who work in their own areas of expertise. With this, you can get more in-depth and accurate service than ever before. Understanding the differences between the three services is crucial to getting the financial help you need. Sometimes you will need more than one (as accountants and bookkeepers often work in conjunction with one another), so think about the individual aspects of each job before you begin hiring anybody. Knowing what each kind of worker does and how they do it is the key to knowing who can best help you complete the work you need to do. What is a bookkeeping service? Gita Faust is the founder & CEO of HammerZen, which helps businesses save time & money by keeping track of The Home Depot purchases and eﬃciently importing receipts and statements into QuickBooks. 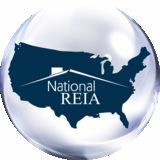 National REIA members receive a free 30-day trial and a discount on their convenient monthly plans. Learn more by visiting www.hammerzen.com. Oftentimes the terms bookkeeper and accountant are used interchangeably, but while they share some overlapping tasks, each of these positions has its own duties that differentiate it from the other. Both your bookkeeper and accountant work to help you with your finances, but there are specific jobs you should entrust to a bookkeeper and others you should give to an accountant. With National REIAU, we have made learning from some of the best fast, easy and inexpensive. National REIAU delivers great lowcost, high-quality investor training on exactly the subject you want, exactly when you want it. Now the question is – where is the snake? the end of the lease that he did sign. The judge gave me a judgment against the wife for back rent and costs, and gave me a judgment for possession against both of them. I think the judge was wrong in letting the ex off the hook, especially given the fraudulent inducement that started this whole mess in the first place, but it was not worth challenging the decision and dragging it out. In talking about this eviction with a local expert I found out that the eviction case would have been dismissed here in Illinois if the tenant had deposited any amount into the account during the course of the eviction – the same as if I had accepted partial rent. This is a danger of setting up a way to get payments that can’t be shut down if you no longer want the tenant to be able to use it. Now, a few days later the tenant moves out – leaving the pet rattlesnake (surprise, surprise) behind. With some pushing, she comes back and gets her possessions out of the driveway and off of the patio and into a dumpster. The rattlesnake’s cage is in the dumpster too. Now the question is – where is the snake? This is the stuff that nightmares are made of. Lesson from a friend on this point – there are some states where rattlesnakes cannot be legally kept as pets. Check on this, because you may be able to get it removed by the authorities. All ends well in this case, except of course for the carpets full of dog poop, and other eviction aftermath. But, at least she and her snake, kids, dogs and cat are gone. About 4 weeks later I get an email from the husband. His lease is up where he has been living, do I have any units available? I’m still laughing! Jane Garvey is President of the Chicago Creative Investors Association. Wholesaling Contracts What is an Assignment Fee? The assignment fee in an assignmentof-contract wholesale deal is the profit an investor stands to make by acting as the middleman. That said, the terms of how the investor will be paid are detailed in the Assignment of Real Estate Purchase and Sale Agreement, and can transpire in more ways than one. More specifically, everything is negotiable, even the assignment fee the investor stands to make. More often than not, the investor will receive a deposit when the Assignment of Real Estate Purchase and Sale Agreement is signed. Not until the transaction is complete and the deal closes, however, will the investor receive the rest of what they are owed (whatever was negotiated beforehand). process, so do not move forward with a wholesale deal until a knowledgeable real estate attorney gives you the green light. What is Double-Close Real Estate? A double closing, otherwise known as a back-to-back closing, is exactly what you’d expect: an investor will purchase a property, only to resell it relatively quickly without rehabbing it. To be clear, while a double closing could take just a few hours, it could also be as long as a few weeks. In fact, double closings aren’t all that different from a traditional buy and sell; they just happen at a much faster pace. Two transactions take place over the course of a double closing. The first transaction, not surprisingly, involves an investor and a seller. The second transaction will then have the investor sell the recently purchased property to a new buyer. Each transaction will have its own escrow and settlement statements; they are two independent transactions. The settlement statement is essentially a summarization of all the fees and charges incurred by both the buyer and the seller over the course of the realestate transaction. Otherwise known as the HUD-1 (under jurisdiction of the U.S. Department of Housing and Urban Development), the settlement statement will be an integral piece of each transaction; the one between the investor and the seller, and the one between the investor and the new buyer. Unlike an assignment of contract, a double closing will actually witness the investor take legal possession of the property. As a result, the investor will show up on the chain of title and, of course, be required to pay the expenses that have become synonymous with buying and selling properties (escrow, closing costs, etc.). line from the costs incurred from the closing process of two independent transactions. Nonetheless, it’s a good option to have in your back pocket. If you are interested in double closing, here’s a simple five-step process: 1. Find A Deal: Not surprisingly, your first step in a double closing is to find a property to purchase that has enough of a discount to warrant a double close. That means it should be able to be purchased at a price that enables the investor to flip it for a quick profit. Remember, the price needs to be attractive enough for a subsequent buyer. 2. Run the Numbers: I recommend running the numbers for the next buyer you intend to sell to. That way, you can show them the potential profit opportunity and make the deal more appealing. This also helps when determining whether or not the home is a viable double-closing candidate. 3. Find a Buyer: Before you even buy the deal, have another buyer lined up. That way you should be able to double close faster and have a better idea of what numbers to expect. At this point, make sure the buyer’s loan will allow them to take part in a double closing (some banks don’t allow it). 4. Buy the House from the Seller: Buy the home from the original owner. Just like a regular transaction, you will go through the closing process and pay any closing costs. You will also receive the settlement statement I previously discussed and be placed on the chain of title. 5. Sell the House to the New Buyer: Proceed to sell the house to the new buyer. Not unlike the first transaction, you will close on the property, just as you would with a traditional sale. As a result, you will receive another settlement statement and incur the usual costs. closing or an assignment of contract. For starters, you must take into consideration the deal’s profit potential. That said, I would recommend looking into a double closing if you find a buyer that is willing and able to pay you a lot more for the property. Of course, you will incur additional closing costs in the event you follow through with a double closing, but the added profit could easily make up for them. In addition to the profit potential, you will need to consider one other very important thing: how the end buyer plans to finance the deal. If the end buyer plans on using a bank loan to buy the home and you intend to sell the contract, you must make absolutely certain to check with the buyer’s lender—to make sure there is nothing that would prevent the transaction from taking place. While it’s not all that common, some banks do have regulations and underwriting prohibiting them from lending money in an assignment-of-contract scenario. Last, but certainly not least, you must consider how long your buyer will take to get their funding lined up. If their timetable takes you past the previously agreed-upon closing date, you may have to consider a double closing. That way, you’ll be able to sell the property to the end buyer when they have the funds available. Today’s investors would prefer to use a wholesale-real-estate contract strategy, whether it’s a double close or assignment of contract. Truth be told, each have their place in the real estate investor’s toolbox. Those that know when and how to use each of them, however, stand to realize the most success. Than Merrill is Founder and CEO of FortuneBuilders, Inc. He has bought and sold hundreds of properties nationwide during his investing career and founded FortuneBuilders with the simple idea of sharing his knowledge and passion for real estate with aspiring investors. As a graduate of Yale University and a former NFL player, Than attributes his success in sports, business and investing to coaching, education and systems. Learn more at www.fortunebuilders.com. when you experience short-term failures. But you just can’t quit too early. It takes time to learn, build confidence, and gain enough momentum to succeed with real estate investing. The slogan “Press On” will solve many of your problems as a new investor. obstacles experienced by new real estate investors. I hope these ideas will help you prepare and overcome the obstacles you face in your own journey. But as you know, you will likely face your own unique challenges – both inside your head and in your local market. How you respond and learn from these obstacles will become your own unique success story in the end! To your real estate investing success! Chad Carson is a real estate investor, world traveler, father of two beautiful children, and husband to his wife & adventure partner. Learn more at www. coachcarson.com where he shares what he knows about real estate investing, money, and life. UNITING INVESTORS What is Uniting Investors? Uniting Investors is an online community brought together by the alliance of The National Real Estate Investors Association, American Rental Property Owners and Landlords Association, the Real Estate Investors Funding Association, and the National Note Buyers Association. Together, these associations have chosen to create an environment where their members can both connect with one another, as well as learn from those with more experience. Visit www.UnitingInvestors.org to sign up today. Benefits of Joining Uniting Investors? Backed by the leading associations in their respective divisions of the real estate industry. Authorities with years of experience in the field post their knowledge for our members to share Don’t see the information you’re looking for? Post it in the community and have it answered by your peers; answers will be rated for accuracy. New, valuable information released weekly to our members in our resource library. You can’t get this anywhere else! Connecting to other real estate investors across the US gives you a unique perspective and advantage; you can share best practices with one another as easily as sharing a picture on social media, but nowhere else will you find this network. residential history, employment history, etc.? These are very important too. *** Dear Landlord Hank: I live in Massachusetts and my lease clearly states that the tenant is responsible to deposit their rent in cash each month into my rental property account. Additionally, my bills, (mortgage, insurance maintenance charge cards etc.) all related to this rental are scheduled as reoccurring payments processed “electronically” by the bank. The lease states that if their rent is not deposited on time, late, or insufficient, then, the tenant is liable for the undetermined cost of NSF (not sufficient funds) “bank” fees as the result until the rent is paid. The tenant gave a 30-day notice to vacate but used the rent due me to give to their new landlord as a deposit, thus, incurred 10 fees @ $37 each. Would this be considered as a valid deduction from their security deposit? — Ed Dear Landlord Ed, This question would be best addressed by an attorney. That being said, you are definitely due you last month’s rent and since the terms in the lease cover this situation. I would think you’d be “reasonable” to think that you could deduct those charges from tenant’s deposit. I hope you have a large enough deposit to cover last month’s rent, late fees, and any damage you find. Good luck.